This RF booster amplifier covers the 1200 to 1900 MHz frequency range and is ideal for integration into tactical radio equipment. Like all of AR Modular RF’s booster products, AR-55L can be used in drop box kits, UAVs, all different sizes of aircrafts, and even water-borne vehicles. 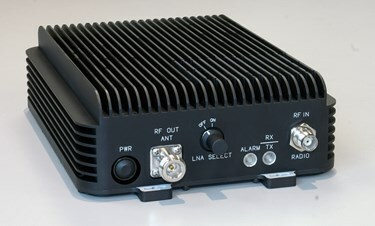 The AR-55L booster amplifier has been designed for use with ANW2, WNW, and SRW networking formats. It features 24V vehicle power supply Voltage Spike, a noise suppression DC line filter, RF sensing, T/R switching, Automatic Level Control (ALC), protection against antenna mismatch, protection against over-temperature, and protection against accidental polarity reversal. It weighs 6 lb and measures in at 2.5” x 6.0” x 7.5”. For more information on general, environmental, and mechanical specifications for the AR-55L RF booster amplifier, download the datasheet.